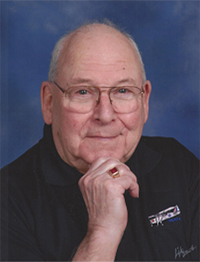 Harold (Hank) Edward Bullock passed away unexpectedly Aug. 11, 2014, surrounded by his family. He was born in Corning, Iowa, on Feb. 5, 1927, the youngest of four boys, where he lived until the family moved to San Diego, Calif., in 1935. After high school, he entered the Air Force and was stationed in the Philippines. He married Barbara Campbell in 1949 and they had two children, Mike and Chris. The family then moved to Oregon in 1958 when Hank joined a new business called Tektronix. He worked there 25 years as a tool and die model maker. In 1975, he married Judy Hanson, and was lucky enough to be stepfather to four more girls, Vickey, Della, Wanda and Lori. In retirement, Hank restored antique airplanes. Some of the parts were impossible to find, so Hank would just create the needed part on his die machines. He was very talented! He restored a 1947 British Auster observation plane from World War ll and flew it to many antique airplane shows all over the country. He won numerous awards for his Auster. It is permanently housed at the Evergreen Air Museum in McMinnville, Ore.
Hank enjoyed visiting the Wood River Valley and especially spending time at his son’s cabin at West Magic. Always up for a good time, he loved participating in the many activities at Magic. Hank is survived by his beloved wife Judy, his children, stepchildren, 10 grandchildren and eight great-grandchildren. He is survived locally by Mike and Wendy Bullock, Keely, Eric and Kaya Eliason, Vickey Hansen (Gile) Williams and Max Monahan, He was also known as Grandpa to Joseph, Matt and Mary Van Zeipel.